Facebook has been hacked. FB ID/passwords are being sold for $2. If you use your Facebook ID to log into other sites, you must change your FB settings. At left side, select "Apps and Websites. This shows other sites that use your Facebook login. Select them and click "Remove"
Under the first six, there may be "View All". Click that to see all of them. At left side, select "Business Integrations". You will see other tools that have access to your Facebook account. Select them and click "Delete"
In the section "Apps, Websites, and Games", click "Edit". This lets you use Facebook to log into other sites. Go to a major site such as CNN etc and there may be 50-75 tracking tags. Corporate lawyers and lobbyists wrote the laws on consumer data tracking to make it legal to track you. They also make sure that Congress won't stop this. What to do? Use Ghostery. It's a free addon for your desktop browser. Sign up (free) and you can block all of the tracking tags. You can allow only the ones that you trust or accept. CNBC published great info on Google's revenues. 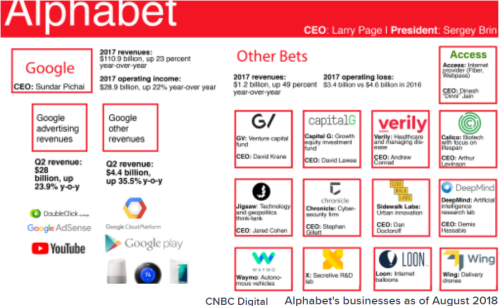 Google Alphabet owns 13 divisions which made $145m in revenue in Q2/2018, but that's a mere .04% of Google's Q2/18 overall $32.66B revenue. Yes, the little 13 bought in money but they lost $732m in Q2/18. Google is losing $587m per quarter to keep these alive. Google calls them "Bets" and pretends they are independant divisions, each with its own CEO, but in reality, they are tightly controlled by Page and Brin, which annoys the fake CEOs. Google advertising made $110B in 2017. If Google made $32.66B in Q2/18, it may go to $130B for 2018. This means Google is a 20-year old one-trick pony that makes all of its money on one thing (ads) and despite investing more than $400B in R&D, it has no idea how to make more money. Google pretends to be a Silicon Valley high-tech company that works in AI, biotech, etc., but really, it's an ad distribution network (ADN). It's not even an ad agency: it doesn't manage or create ads for clients. It just distributes ads. There's nothing unique or proprietary about that; there are hundreds of ADNs. Google just happens to be the biggest one... for now. What are those thirteen Google divisions? GV (VC). capitalG (investments). verily (healthcare). Access (fiber, but that's dead now). Calico (biotech, lifespan). Jigsaw (tech + geopolitics... hmm, Google's military wing?). chronicle (cybersecurity). Sidewalk Labs (urban innovation). Deepmind (AI). Waymo (autonomous cars). Loon (Internet balloons). Wing (drones). X (the secret lab to make more divisions). Note that many of these are spelled with lower case: capitalG, verily, chronicle. That shows their startuppyness. Google Maps is okay if you're in a city because if the Google Map is wrong, you can find a gas station or similar and get directions or help. But if you're hiking away from developed areas, an error in Google Maps can be deadly. If you rely on the map and it leads you in a wrong direction, you can die. Google Maps should not offer maps for undeveloped areas. It should either show "No Information for this Area" or a link to an app with topological maps, such as Gaia GPS or Backcountry Navigator (both Android apps). People have gotten into dangerous situations due to errors in Google Maps, such as Amber VanHecke. But Google has not fixed this. They know it's a problem, so when someone dies, Google Maps will be liable. Steve Jobs' commencement speech at Stanford 2005 may be the best commencement speech ever given. But what about the guy who spoke AFTER Steve Jobs? Here's the story of that forgotten speech. He was scheduled to speak after the main speaker, but he played Stanford football and he didn't really know who Steve Jobs was. Anyway, graduation was three days (and nights) of endless party and drinking and he fell asleep at 4am of the big day. He got up at 10a, covered up with a cap and gown, and dragged himself down to the stadium. But... no speech in hand. So while Steve went on for 15 minutes ("connecting the dots", "love & loss", "death"), my friend asked all his football buddies for quotes, inspirationals, whatever, the stuff that football players say ("keep your eye on the ball" and so on) and it got all scribbled down on scraps of paper. When Jobs finished with his speech with "Stay foolish", everyone was so caught up with emotion over such a great speech that when my buddy got up and gave his rambling talk, whatever he said was totally forgotten. Which was quite okay, because it was such a horrible speech. In the chaos of the commencement day, he lost his scraps of paper, so the speech is lost forever. Luckily for everyone. 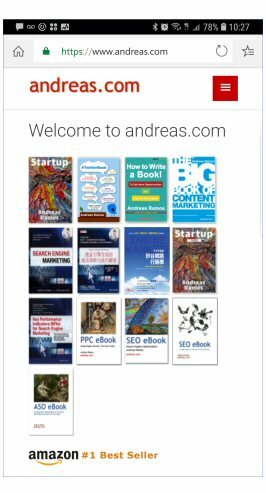 I started andreas.com in 1995. From 1995 to 2003, I created pages in HTML by hand and posted them as an ongoing chronicle, long before anyone called it a "blog." Many of those blog postings became pages, which you can read at Stuff. From 2003 to 2010, I used Blogger to write my blog but Google bought Blogger, messed it up, and finally, they abandoned Blogger. I switched to Wordpress because everyone was using it and I wanted to learn how to use it. But I got tired of the endless hacking and dozens, if not hundreds, of daily spam comments. Wordpress has lousy security and it's very hackable (there were over 5,000 spammer pages on my server). You spend lots of money on security upgrades, security tools, and constantly upgrading to stay ahead of spammers and hackers. Wordpress is good for companies that want low-level staffers to add text to a page, but to make significant changes to the website, you need to hire a Wordpress developer. In 2016, Google began to notify that it will give priority to mobile-first websites. If Laura is using her mobile phone to search in Google, then Google will show mobile-friendly websites at the top of the list. By 2018, 70-80% of searches at Google are done on mobile phones. In early 2018, Google said, "okay, that's it, if you want your site to show up in mobile searches, your site must be mobile-friendly". Sites must also be HTTPS (S for secure). If not, you don't show up in Google search results. I also deleted many pages. My website had grown to over 500 pages. Google Analytics shows the traffic for every page at my site, so I sorted pages by traffic and keep the 100 most popular pages. That's okay; many were obsolete because technology changed or the sites didn't exist anymore. If you see a broken link, please let me know. I've always worn a watch. I was curious about digital watches; so I tried the Samsung Gear S3 digital watch. I chose this one because I have a Samsung Galaxy Note 8 phone. However; I think my experience with this watch applies generally to all digital watches. The watch face is a screen; so it's illuminated. That works well indoors; but it's impossible to see the screen in bright sunlight. The watch is intended for active outdoors; but it's useless in sunlight. A mechanical watch with glow can be seen in any light (or darkness) in any weather condition. It's clumsy to use the watch. I tried the timer when I boiled a 4' 30" egg. It takes seven clicks to set the timer. Spin the bezel to select the timer; etc. But the timer only has minutes; I can't set it to four minutes and thirty seconds. It's possible this can be done; but it's not obvious. When you take off the watch; it's only use is to hold down paper on your desk. I can set my mechanical watch on my desk so the watch face shows the time. When you take off the smart watch; it conserves battery... by turning off the screen which means you can't see the time. The rotating bezel. In high school; I started scuba diving so I've always had diver watches. These have a rotating bezel (a ring around the watch face) that you can turn to keep track of time. On smart watches; you turn the bezel to select apps and settings; which means you can't keep track of time. You can receive and make phone calls with the watch by holding your wrist up to your ear. In your other hand; you hold your cell phone. That's... silly. The same for email and text messages on your watch: why not just look at your phone? The watch has settings. No; it has lots of settings. It's a bit of a challenge to navigate dozens of screens on a one-inch display. Too much pre-loaded junk. I deleted all sorts of useless apps and games. I assume these watches have yet more tracking and reporting capabilities. I don't want hundreds of companies to know my pulse; oxygen level; body temperature; motion; location; and so on. The watch face can't be configured. It'd be easy for Samsung to add this; but they don't. You can use dozens of apps at app stores to configure your watch face; but I strongly recommend that you avoid apps unless they are a) absolutely necessary and b) come from known companies. There is too much spammer / tracking / spyware / virus on free apps. The watch battery will last about three days. This is fine if you stay in town; but we often go on week-long outdoors trips. After three days; a digital watch will be useless. My mechanical watch (Citizen diver's watch in a titanium case) has lasted fifteen years so far and will likely last 50 years. Any good watch; such as Rolex; Citizen; Breitling; Tag Heuer; Seiko; etc. will last 50 years. But we all know digital devices rarely last longer than three years: either they stop working; the battery dies; or they become obsolete. If you spend $300 every three years; why not just pay $1,000 and get a watch that will last decades? Digital watches are a nice idea; but so far; not better than mechanical watches. To justify its use; a digital watch has to be substantially better than a mechanical watch in all conditions. After ten days; I returned the smart watch. As you may have read; the Congress critters were clueless and Mark Zuckerberg gave..., well..., sort-of-answers, but not really answers. Okay; here's the real story. FB; Google; Youtube; Instagram; Twitter; etc. (BTW; there are at least 61 social media sites) all make their income via advertising. Google made $100B in 2017 (about 85% came through advertising; per Bloomberg). FB made $40B in 2017. To make money; they give demographic information to advertisers. This lets advertisers show ads to (e.g.) women; age 18-24; living in Dallas; college-educated; like jogging; etc. There are around 1,500 criteria that allow advertisers to precisely define their audience so ads can be targeted specifically those people. This is also why FB/Google/etc. are more successful than any newspaper or magazine. No newspaper could possibly create 250,000 personalized versions of their newspaper to reach every reader. Web-based ad-driven companies can easily do that. There is not "one Amazon"; Amazon has 310m customers; every customer gets her own personalized Amazon page that shows only the products that appeal to her. There are 310m Amazons. How many Facebooks are there? 2B; or one for each user with ads targeted just for that user. How BIG is Facebook? FB itself has about 2.13B members and growing at about 3% per quarter (64m new members per quarter). FB also owns Instagram (800m and growing +12% per quarter; or about 100m new members per quarter); WhatsApp (1.5B users; +13% per quarter; which is 200m new members per quarter); Messenger (1.2B; growing 17% yearly; or about 200m users per year) all numbers for Q4/17). There's overlap in many of these users: Many Facebook users also use Messenger and Instagram. So the total is perhaps 3B? No; it's more than that. If a webpage has a Facebook button on it; the button is collecting data and sending it back to Facebook. Hundreds of millions of page have these buttons and they're tracking you; even if you aren't a member of any of Facebook's tools. Both FB and Google (and many other social sites) are collecting vast amounts of data. The NYT's total revenues for 2017 are a pitiful $1.7B. Their profits were a measly $100m. I have friends who earn more than that. To put it bluntly; the NYT could disappear next week and FB/Gooogle wouldn't even notice. If G/FB continue to sell ads; they MUST offer detailed user information. That's what makes it useful to advertisers. Solution? No more ads. G+FB+etc switch to freemium. Free baby version to users who won't pay; Subscriber version with extra features to subscribers; and Corporate version for business users. Thus very little need to collect 1,500 criteria on the users and no need whatsoever to share user information with advertisers because there would be no ads. Many Silicon Valley companies use the freemium model. On average; about 5% of users pay for service. Let's say FB charges $5/mo for subscriptions. Of 2B users; only 100m (5%) may pay. $5/month X 100m = $6B. FB's $40B revenues would drop 85% and revenue growth would be low single digits. Their stock valuation would collapse from $480B to... well; way less. Investors would flee. (The actual numbers will be much lower in India; Southeast Asia; Africa; where many users are unable to pay $100 per year). The same for Google. How many would actually pay to use Google/Gmaps/Gmail etc.? 5%? Less? The switch to non-ads could be done. But it'd shatter the Silicon Valley billion-dollar companies. Who else depends on FB/Google data? The US Government and politicians. The government uses this data for surveillance. Politicians all use FB/Google for election campaigns. They are not going to shoot the Golden Goose. Go to my blog postings for 2003, 2005, 2006, 2007, 2008, 2009, 2010, 2012, 2013, 2014, 2015, 2016, 2017, 2018.